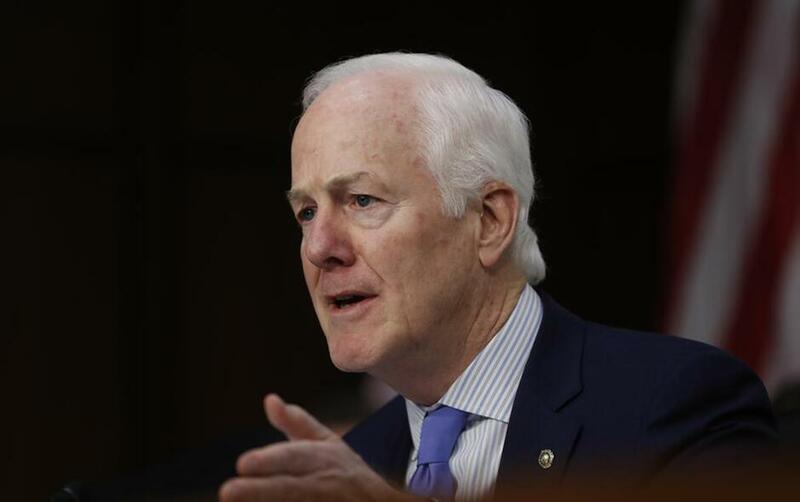 Senate Judiciary Committee member Sen. John Cornyn, R-Texas speaks on Capitol Hill in Washington. President Donald Trump is considering nearly a dozen candidates to succeed ousted FBI Director James Comey, choosing from a group that includes several lawmakers, attorneys and law enforcement officials. WASHINGTON (AP) — Former Director of National Intelligence James Clapper on Sunday described a U.S. government "under assault" after President Donald Trump's controversial decision to fire FBI director James Comey, as lawmakers urged the president to select a new FBI director free of any political stigma. "I think, in many ways, our institutions are under assault, both externally -- and that's the big news here, is the Russian interference in our election system," Clapper said. "I think as well our institutions are under assault internally." When he was asked, "Internally, from the president?" Clapper said, "Exactly." Clapper spoke following Trump's sudden firing of Comey last week, which drew sharp criticism because it came amid the FBI's probe into Russia meddling in the 2016 presidential election and possible ties between Russia and the Trump presidential campaign. Clapper said America's founding fathers had created three co-equal branches of government with checks and balances, but with Trump as president, that was now "under assault and is eroding." Lawmakers from both parties also criticized Trump's actions last week, which included changing explanations from the White House for the firing and an ominous tweet by Trump that warned Comey against leaks to the press because he may have "tapes" of their conversations. The lawmakers urged the president to select a new FBI director without any political background. Republican Sen. Lindsey Graham, a member of the Judiciary Committee, said promoting an FBI agent to lead the agency would allow the nation to "reset." He dismissed as less desirable at least two of the 14 candidates under consideration by Trump, former Rep. Mike Rogers of Michigan and Sen. John Cornyn of Texas, explaining that "these are not normal circumstances." Rogers, an ex-FBI agent and former chairman of the House Intelligence Committee, has drawn the backing of the FBI Agents Association. Cornyn is the No. 2 Republican in the Senate. "It's now time to pick somebody who comes from within the ranks, or is of such a reputation who has no political background at all who can go into the job from Day 1," the South Carolina Republican said. Asked whether Rogers or Cornyn would be good choices, Graham flatly said, "no." "The president has a chance to clean up the mess he mostly created," Graham said, adding, "I have no evidence the president colluded with the Russians at all, but we don't know all the evidence yet." Senate Minority Leader Chuck Schumer of New York said the new FBI director should certainly be someone "not of partisan background" with "great experience" and "courage." He left open the possibility that Democrats might try and withdraw support for a new FBI director unless the Justice Department names a special prosecutor. Under rules of the Senate, Republicans could still confirm an FBI director with 51 votes. Republicans hold 52 seats in the chamber to Democrats' 48. "I think the process is going to go quickly. Almost all of them are very well-known," Trump said of the candidates before Air Force One took off for Lynchburg, Virginia, where he gave the commencement address at Liberty University. "They've been vetted over their lifetime essentially, but very well-known, highly respected, really talented people. And that's what we want for the FBI." Trump abruptly fired Comey on Tuesday and later said Comey was a "showboat" and "grandstander" who was not doing a good job. The firing drew a wave of criticism in large part because the FBI has been investigating whether election meddling by Russia involved people in Trump's presidential campaign, and Trump said in an interview with NBC that the investigation factored into his decision to fire Comey. The changing rationales the White House offered added an element of chaos to the president's action. The FBI director serves a 10-year term but can be replaced by the president. So far 14 people — lawmakers, attorneys and law enforcement officials among them — have emerged as candidates. Eight met at the Justice Department on Saturday with Attorney General Jeff Sessions and his deputy, Rod Rosenstein. The first candidate to arrive for interviews was Alice Fisher, a high-ranking Justice Department official in the George W. Bush administration. Also interviewed were: —Adam Lee, special agent in charge of the FBI's office in Richmond, Virginia. — Andrew McCabe, the acting FBI director. —Michael J. Garcia, a former prosecutor and associate judge on New York's highest court. —Cornyn, a former Texas attorney general. —U.S. District Judge Henry E. Hudson, a Bush appointee who struck down the centerpiece of the Obama administration's health care law in 2010. —Frances Townsend, a former Bush homeland security and counterterrorism adviser. —Rogers. The FBI Agents Association says it believes his diverse background makes him the best choice. Fisher and Townsend were the only women on the list of candidates. The FBI has never had a female director. Sessions has faced questions over whether his involvement in Comey's firing violates his pledge to recuse himself from investigations into Russian interference in the election. Some lawmakers have alleged the firing was an effort to stifle that FBI probe. Clapper and Schumer made their comments on CNN's "State of the Union"; Graham spoke on NBC's "Meet the Press."